David Jones is very close to the Australian fashion heart. The concept of the high-street department store was first conceived by David Jones in 1838. He wanted the store to offer exclusive goods that were leading in the market, and focused on catering to the everyday needs of people. It wasn't long before the enterprise outgrew its humble beginnings on George Street. In 1899, it established a manufacturing plant in Sydney that would supply David Jones clothing, in addition to imported merchandise from other international fashion labels. In the post-war era, David Jones organised runway shows that captured trends in European fashion. An important event on its timeline is when David Jones brought Christian Dior's “New Look” collection to its stores in 1948. Another landmark event for David Jones, Australia was when a young Queen Elizabeth II stepped into the store’s ‘The Great Restaurant’ on the 7th floor for a royal banquet in 1954. The David Jones label, marked with its signature houndstooth patterned logo, has grown to become a favourite in Australian fashion, fondly referred to as 'DJs'. The creator's far-sighted vision predicted that the solitary black and white logo on the packaging would suffice for audiences to recognise the brand. 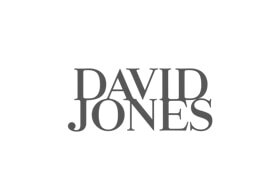 Today, David Jones is one of Australia's oldest and most trusted department stores that features lifestyle products from both international and Australian brands. The prestigious department store has reinvented itself to stay relevant through changing times. Celebrity models that endorse the brand include like Miranda Kerr, Megan Gale, Jason Dundas, Montona Cox and Jessica Gomes. David Jones celebrated its 175th year anniversary in 2013, after reigning as the preferred shopping destination for generations of Australians. The David Jones Chadstone store has a sweeping portfolio of Australian and international designers. The store extends to both ground and lower levels with convenient parking in the David Jones car park.